Chia oil is extracted from the seeds of the salvia hispanica, a plant native to Central America. Chia seeds are now widely used due to the many health benefits attributed to them. Chia seeds are known for containing a high amount of essential fatty acids, and especially omega-3 in the form of alpha-linolenic acid (ALA). Wikipedia has a chart noting chia's advantage over all the other main plant sources of ALA. The chart is part of an article that also discusses ALA's health benefits, sourced with specific scientific studies. Aside from omega-3 ALA, Chia seeds also contain other essential fatty acids, includingomega-6, and a very small amount of Omega-9. Both are also beneficial for human health. 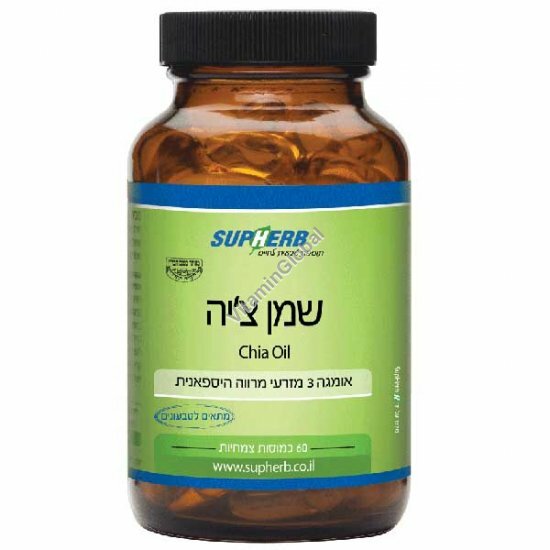 Chia oil taken as capsules is an easy and convenient way to integrate this wonderful plant source of ALA omega-3 into one's daily diet. Instructions for use: 1-2 capsules per day, at mealtime. Contents: 60 Vcaps. Suitable for vegetarians. SupHerb'sChia Seed Oil is not tested on animals. Pregnant women, lactating women, those on medication, and those considering this product for their children - please consult your physician. This information is not medical advice and is not indicatory. In case of a medical problem, contact your doctor.